In May 2013, Silk Road was taken down for a short period of time by a sustained DDoS attack. 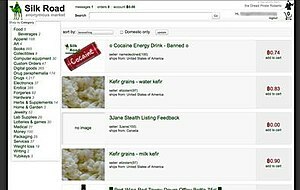 On 23 June 2013, it was first reported that the DEA seized 11.02 bitcoins, then worth a total of $814, which the media suspected was a result of a Silk Road honeypot sting. The FBI has claimed that the real IP address of the Silk Road server was found via data leaked directly from the site's CAPTCHA, but security researchers believe that the PHP login page was manipulated to output its $_SERVER variable and real IP following site maintenance reconfiguration. Thanks in part to off-duty research conducted by IRS criminal investigator Gary Alford, Ross Ulbricht was alleged by the FBI to be the founder and owner of Silk Road and the person behind the pseudonym "Dread Pirate Roberts" (DPR). He was arrested on 2nd October 2013 in San Francisco at 3:15 p.m. PDT in Glen Park Library, a branch of the San Francisco Public Library. Ulbricht was indicted on charges of money laundering, computer hacking, conspiracy to traffic narcotics, and attempting to have six people killed. Prosecutors alleged that Ulbricht paid $730,000 to others to commit the murders, although none of the murders actually occurred. Ulbricht ultimately was not prosecuted for any of the alleged murder attempts. ^ a b Martin, Jeremy (2015-05-15). The Beginner's Guide to the Internet Underground (2nd ed.). Information Warfare Center. ASIN B00FNRU47E. ^ a b c "Case 76: Silk Road (Part 1) - Casefile: True Crime Podcast". Casefile: True Crime Podcast. 2018-02-11. Retrieved 2018-06-11. ^ Cubrilovic, Nik (7 September 2014). "Analyzing the FBI's Explanation of How They Located Silk Road". Retrieved 9 August 2015. ^ "Why the hidden internet can't be a libertarian paradise – Henry Farrell | Aeon Essays". Aeon. Retrieved 2017-04-14. ^ a b "Case 76: Silk Road (Part 3) - Casefile: True Crime Podcast". Casefile: True Crime Podcast. 2018-02-22. Retrieved 2018-06-12. ^ "Silk Road stunner: Ulbricht admits founding the site, but says he isn't DPR". Ars Technica. Retrieved 2015-11-07. ^ Mullin, Joe (13 January 2015). "Silk Road stunner: Ulbricht admits founding the site, but says he isn't DPR". Ars Technica. Retrieved 2015-11-07. ^ Editorial, Reuters. "U.S. Supreme Court turns away Silk Road website founder's appeal". U.S. Retrieved 2018-07-01. ^ "Nederlandse Silk Road-handelaar riskeert 40 jaar cel". emerce.nl. 2014-04-26. Retrieved 2015-05-30. ^ "Nederlandse internetdrugsbaron krijgt in VS 10 jaar cel". nos.nl. 2015-05-29. Retrieved 2015-05-29. ^ "This Researcher Is Tallying All the Arrests From Dark Web Markets". Motherboard. Retrieved 2017-04-18. ^ Hong, Nicole (2015-05-29). "Silk Road Founder Ross Ulbricht Sentenced to Life in Prison". Wall Street Journal. Retrieved 2015-05-30. ^ Zetter, Kim. "Feds Arrest Alleged 'Dread Pirate Roberts,' the Brain Behind the Silk Road Drug Site". WIRED. Retrieved 2017-04-18. ^ "The Untold Story of Silk Road, Part 1". WIRED. April 2015. Retrieved 2015-06-09. ^ "Silk Road successors". The Economist. May 29, 2015. Retrieved 2015-05-30. ^ "The Silk Road book club is about what you'd expect". The Daily Dot. 2014-01-31. Retrieved 2017-04-18. ^ Evans, Martin (2019-04-12). "Silk Road 2.0 Dark Web mastermind revealed as university dropout". The Telegraph. Retrieved 12 April 2019. ^ Cox, Joseph (2019-04-12). "Silk Road 2 Founder Dread Pirate Roberts 2 Caught, Jailed for 5 Years". Motherboard. Vice Media. Retrieved 12 April 2019. ^ "Ross Ulbricht's defense team argues Silk Road made buying and selling drugs safer". Business Insider. Retrieved 2017-04-18. ^ "Silk Road May Have Actually Made Dealing Drugs Safer, But Not Everyone's Buying That | VICE News". VICE News. Retrieved 2017-04-18.